Dusty Hernandez-Harrison knocked out veteran Bruce Rumbolz in the opening round this past Saturday night at the Grand Theatre in New Albany, Indiana. Harrison landed a left to the body followed by a left hook to the head of Rumbolz, dropping him to the canvas against the ropes. Referee Russ Withers counted Rumholz out at 1:46. The fight against Rumbolz was Harrison’s first since September of 2016, when he defeated Thomas LaManna by unanimous decision in a clash of fringe welterweight contenders. 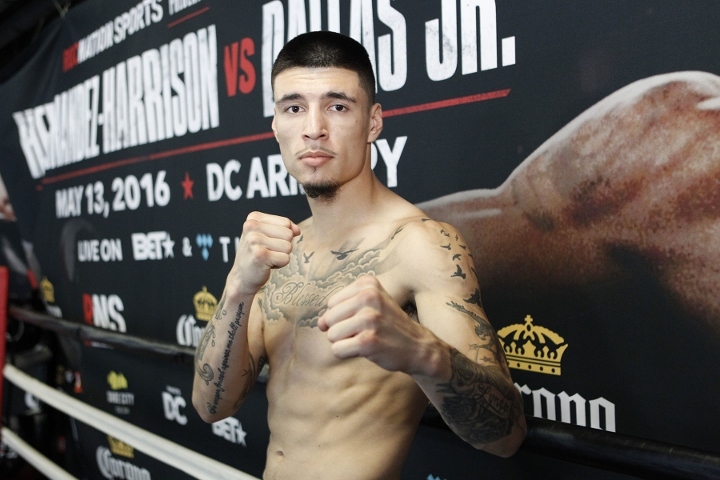 Harrison (31-0-1, 17 knockouts) weighed in at 170 pounds on the same day of the Rumbolz fight. The 24-year-old Harrison, who was a significant following in and around his hometown of Washington, DC, was recently release from his promotional deal with Roc Nation. He has a fight lined up last month in New Cumberland, West Virginia, but the fight fell through when his opponent never showed up and a suitable replacement was never found. Harrison felt a sense of relief in his return to the ring on Saturday, but believes he is now playing catch-up to recover for lost time. Word is Harrison will return to the ring on Apr. 20. “I want to stay active as (much as) possible and get bigger fights as soon as possible,” said Harrison. The 45-year-old Rumbolz (22-36-2, 15 KOs), who resides in Sterling, Illinois, has now lost his last 18 bouts over a span of almost 10 years. In welterweight action, 41-year-old Cesar Vegas defeated Thomas Amaro by unanimous decision over six rounds. Scores were 59-55, 59-55, and 60-54 in favor of Vega, who improves to 12-16-1, 2 KOs. The 42-year-old Amaro (4-15-1, 3 KOs) has lost three of his last four bouts. Flyweight Saleto Ortega Henderson (3-0, 2 KOs), who is 19 years old, knocked out Richard Tallmadge (0-4) at 34 seconds of the opening round. The fight card was promoted by CTH Boxing Promotions. ← Just what WrestleMania’s main event build needs… Stephanie McMahon!